Chili is a useful medicinal and magical plant. 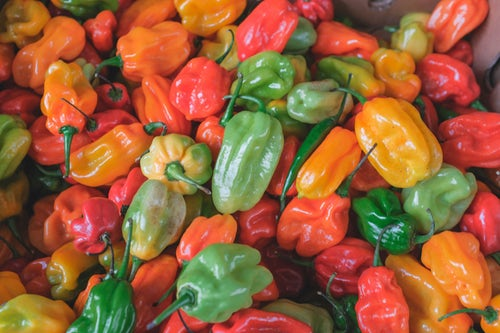 This spicy fruit is delicious in a variety of cuisines, from Mexican to Indian and many in between. Modern research has found many health benefits, and the modern witch can use chili for a range of spells and magics. Chili is a beautiful plant, with striking foliage and stunning, glossy fruits ranging from scarlet to shades so deep they’re nearly black- perfect for the inner goth! Read on to find out why chili is such a useful ingredient for mundane and magical use. Not everyone likes spicy food, but chili pepper adds flavour as well as heat. It’s all about choosing the right chili and getting the quantities right. As this isn’t a cookery blog, I won’t go into too much detail- I could wax lyrical for days about the tastes of different chilies! But it’s worth noting that you can vastly remove the heat of any chili you want to cook with by removing the seeds. We use scotch bonnets for when we want a deep, savoury flavour- often in dishes that are slow cooked as these chilies handle this really well. We use jalapenos to throw in to pasta or fajitas, or tiny birds eye chilies to add bite to Thai or Chinese food. I’m a total chili addict, and even when we don’t have fresh chilies in the house, I always have some dry habaneros for emergencies, plus a frankly ridiculous range of pepper sauces. Currently, I even have some dried scorpion chili- not for the faint hearted! Growing chilies is pretty easy if you have a hot, sunny garden, or a greenhouse, or a decent sized window-sill that catches the sun. I grow mine indoors as I live in a cool climate. I plant a few seeds in moist soil in a pot, cover them with a clear plastic bag or upside-down soda bottle, and wait for them to germinate. Once they have several leaves, I put them into individual pots. Then, it’s all about making sure they’re watered- but not too much- and have access to light. I also manually pollinate the flowers, in the absence of pollinators! Mrs Grieve refers to cayenne pepper in her Modern herbal, but also uses the synonyms bird pepper and African pepper, so it’s clear she’s talking about hot chilies in general. She states it is a powerful stimulant, and aids in digestion although it can also cause problems due to chili being an irritant. 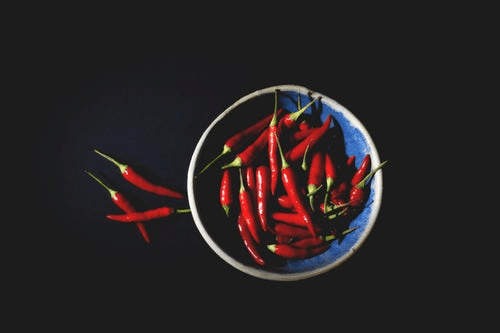 Indeed, one of the reasons hot chilies are added to food is to increase the stomach acid in order to kill more bacteria- useful in hot climes where it is hard to keep food cool and fresh. She states that in the West Indies, a concoction called Mandram is made with chili, citrus, cucumber and onion as a remedy for weak digestion. Gargling with a tiny amount of chili in rose water was a remedy for sore throats or a relaxed uvula- not recommended without expert experience! Cunningham tells us that chili is a masculine herb, rule over by Mars- no surprise, considering the fiery connotations! He also states it is one of the plants associated with fidelity and can be used to break hexes or reveal hidden things. One of the spells he shares is for when you fear your lover is straying. Cross two dried chili peppers then tie them with red or pink ribbon. Sleep with the peppers beneath your pillow to ensure your partner’s loyalty to you. Adding chili powder to love spells will ensure the love is passionate or ‘hot’. Pueblo and Hopi tribes have used chili pepper in rituals, and Maya tribes believed the chili had healing and protective powers. Columbus was attacked with flaming chili bombs full of habaneros when he arrived in the ‘New World’- an appropriate response, really. There is a Zuni legend which tells the strange story of the origins of the chili plant. Thunder and lightning were stolen from the gods, and two youths played with them until the accidentally killed their grandmother. Where they buried her, the chili plant grew, its fruits imbued with the fiery power of her scolding tongue. Chili flakes are used in Hoodoo to jinx an enemy, in various powders and dusts. Sprinkling chili around a rival’s home brings them bad luck and difficulties in life. Chili can cause break ups or make an unwanted guest leave. However, it’s also used for cleansing. 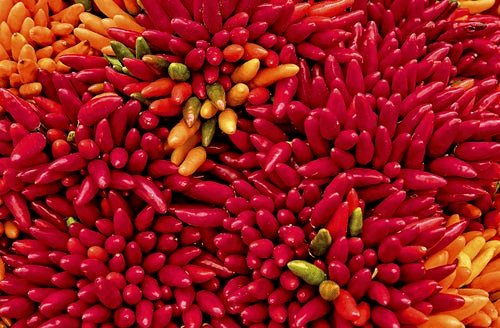 The Latin name capsicum is derived from the Greek word meaning ‘to bite’, referring to the spiciness when eaten. She is the author of A Modern Celt: Seeking the Ancestors & Pagan Portals – Celtic Witchcraft: Modern Witchcraft Meets Celtic Ways. Star anise is a beautiful, fragrant spice from China and Vietnam often used in cooking and medicine. The Latin name is illicium verum. The fruits are green and resemble star-shaped flowers when first picked. When they are dried, the fruits harden and turn a dark, reddish brown and the star shape becomes more prominent. The ‘arms’ of the star pop open to revel smooth, shiny brown seeds. The whole fruit is used as a seasoning for many different types of cuisine, most notably in the Chinese five spice mix which is widely used in Oriental cooking. The star shape makes this fruit immediately intriguing as a magical ingredient. The powerful, aniseed-like scent speaks of mystery and wonder, whether it’s rising from a specially seasoned morning coffee or some carefully crafted incense. Read on for more information on how star anise is used in medicine and magic. The first point in using star anise as a medicine is to ensure it is never confused with Japanese star anise. Japanese star anise, or illicium anisatum, is also known as the Sacred Tree and is highly revered by Buddhists. The leaves are used as incense, but the fruits and seeds are highly toxic. Unfortunately, it’s almost impossible to tell the difference between dried Japanese and Chinese star anise fruit. Because of this, it’s important to purchase your star anise from a reputable and experienced supplier. Alternatively, if you’re able to grow your own, this is the safest way forward. If in doubt, do not consume, as the toxic substance anisatin causes severe inflammation of the urinary and digestive tracts. 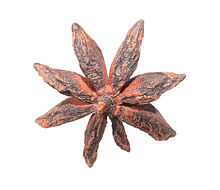 Chinese star anise is the only edible variety and the only variety that should be used for medicinal purposes. Now that the dire warnings are out of the way, the good news is that Chinese star anise is incredibly medicinally important. It’s one of the primary source of shikimic acid which is used in anti-influenza drugs. There are many sources of shikimic acid, but star anise is so relied upon that when there is a serious flu outbreak, global shortages of the spice tend to occur. Web MD states that star anise is also used for a range of ailments including colic and other digestive issues, coughs, bronchitis and congestion. It may be useful as a galactagogue; a substance that promotes the flow of breast milk. However, it should be avoided during pregnancy as can affect the uterus. Mrs Grieve states in her Modern that the oil from Chinese star anise is identical to oil of anise, from the unrelated anise plant. This is why the two plants have such a similar taste. Many animals are highly attracted to anise oil. Hunt saboteurs have been known to use it to throw hounds off the trail of a pursued fox or hare, and it has historically been used in mouse traps as bait. In The Green Wiccan by Silja, star anise is one of the 52 herbs she focuses on as important tools of magic. The author states that star anise is an herb of the element of air. This means it would make a beautiful addition to the eastern point of an altar or sacred space, and an ideal ingredient for any incense. Star anise is associated with the planet Jupiter, associated with expansion and luck (Practical Planetary Magick, David Rankine and Sorita d’Este). Jupiter has historically been known as beneficent and positive, meaning plants associated with it, such as star anise, can be used for magic with a positive leaning. Jupiter is also associated with law and ethics, meaning it can be connected to justice and doing the right thing. Use star anise to gain success in business ventures or new projects. Star anise is also linked to Apollo and Hermes, making it a tool of poetry, music, traveling and communication. and poetry can, of course, be tools for communication, which makes me wonder if this is one of star anise’s strongest traits. Perhaps a witch could use star anise to find different ways to deliver a difficult message, or to open up about something they’re having a hard time expressing. Silja links this plant to magic for consecration and purification, which can be done via incense or scattering the seeds. The author also states the spice can be used for breaking curses and removing negativity, particularly when used in food. Kitchen witches should add star anise into their recipes for a boost of humour and joviality in their lives. Indian cookery is great for this. My favourite is a biryani; a fragrant rice dish with whole star anise. The Latin name for Chinese star anise, illicium verum, originates from illicio which means ‘alluring’. This refers to the irresistible scent of the fruit. Image credits: guangxi – star anise farm in china 2005 by fuzheado via Wikimedia Commons, licensed under the Creative Commons Attribution-Share Alike 2.0 Generic license. As nearly everyone knows, light seeds of what will manifest during the coming year, are sent by the spirit world down hur’s sword of light to the base of everyone’s spine on Midwinter dawn. I can usually feel a sizzling at the base of my spine that day, when I first step out of my little cottage into the daylight. But there’s much more that follows after, which no one at all seems to recognize. As a light healer, reading energies, it’s easy for me to see these. And so, this month, I want to write about what I’ve observed over many years. Those hurian light seeds of the year ahead settle down into the energetic soil of everyone’s womb (both men and women have inner female and male structures inside in light), where they remain for three days, while the Goddess decides the exact form and timing the new impulses of light will take over the year to come. The dark cosmic sea, keeper of all things unborn, floods every person’s abdomen as well. One could call it the unconscious, for it is. Always, there’s one central thrust of growth for each person over the year to come, growth that will involve facing specific fears or outer challenges meant to build a brand new part of the self within. This new gift or talent is always divine, a small piece of each person’s self-of-light or highest destiny that will eventually emerge during everyone’s final lifetime on earth. This divine self was seeded into us at the very moment of our creation into light, long, long, ago, on the Creator Sun, the highest light structure in the seventh heaven, so say my druid guides. You could think of this new self-of-light that grows into fulness each year as each person’s own divine child of that cycle, too. That’s how my guides speak of it, anyway. Our own divine qualities always reflect the Creators, too, the White Tara and Oghama, Goddess and God. So, after three days in the cosmic sea, the first structures of the year’s divine child emerge from everyone’s abdominal unconscious and move into each person’s high heart or thymus. The thymus is the inner child heart, where our divine children anchor in most strongly. This happens on Christmas dawn. This child within looks like an infant-of-light, and I find this time most magical, for I can always feel the soft loving-kindness essence of the divine children filling my spirit on that morning. Even amid the bustle of cooking for visiting relatives, I try to find a few moments of quiet to sense what this impulse of growth for the year ahead may bring for me. And this divine infant is one of twelve parts of our inner spirits that everyone has, all twelve with specific vibrations, regencies of the spirit, and directives in life. You could call these twelve parts of everyone’s spirit their personality, too. These twelve parts of our inner spirits exactly match the twelve gods and goddesses of the Creator Sun as well. And always this emergence of the divine child inside everyone releases a bright beam of hope, a ray of clear diamond light. It will see that, during this first druid moon of the year, the Birch moon, some memory or long-cherished desire will be brought to each person’s attention. This is the first hint of what will manifest for each of us at the end of the coming year, something we’ve long wished for. And this promise of fulfillment stirs up desire from our depths to face and heal whatever fears may be in its way, so this dream will definitely come to be at the end of the year. Over the year ahead then, this impulse get fleshed out as we push against the thorns and briars in our paths. On Imbolc, the little girl part of each person’s spirit emerges from this abdominal sea. On the Vernal Equinox, the toddler boy emerges. Then the feminine virgin on Bealtaine, the masculine virgin at Midsummer. The inner god and goddess are active during the Oak (May/June) and Apple (July/August) moons, not the solstice/equinox/cross-quarter-day festivals. The inner mother part of our spirits arises at Lughnasa, the inner father at the Autumnal Equinox, the feminine grandmother at Samhein, and finally, the inner grandfather at Midwinter. This is when our new divine part of self is finally complete, fully born into all twelve parts of our inner selves-of-light. It’s the realization of our sweet dream of the year before. May your own divine child for the year to come be utterly miraculous, bringing an end to want, perhaps, a special destiny, a love like no other. I always hope for the beginning of real peace, unity between peoples, an end to war and privation in the places of most intense global suffering. But these are dreams that will take us all to achieve. For now, it’s enough to feel that sword of light and let it lead you all year long. Let’s walk this road together into the awakening of everyone’s divinity, all of us a shining star in our own personal areas of endeavor. May this season of magic be the very best you’ve ever had! She is author of Guardians of the Celtic Way: The Path to arthurian Fulfillment (her name was Jill Kelly then), and Alba Reborn, Alba Reborn, Book One, Revised, Alba Reborn, Book Two, and Alba Reborn, Book Three. Calendula or marigold? Last month we explored the magic and mystical beauty of the true marigold and I mentioned in that article that marigolds are often confused with calendula. Botanically they are actually very different. Calendula are often called pot marigolds or common marigolds, but true marigolds are in the genus tagetes although both tagetes and calendula are in the Asteraceae family, along with sunflowers. Tagetes are native to North America, whereas calendula came to America from the Mediterranean. They have beautiful orange or yellow blooms, with an extremely long flowering season. She refers to calendula as the common marigold, and notes that it is easy to grow as long as the position is slightly sunny and the ground kept free of weeds. Calendula self-seed, and can spread quite easily although they are annuals so the new foliage replaces last year’s plants, rather than joining them. The seeds are curly little horns, perfectly beautiful and very decorative in their own way. Calendula petals can be used as a substitute for saffron, but only for the yellow colour they impart, not the taste. The flowers make a tasty and beautiful garnish for salads and other foods, and can be mixed into butters and cheeses for colour and flavour. Even the peppery leaves can be eaten to add spice to a salad. Natural Living Magazine published a great feature on calendula and its many practical uses. The publisher, Amanda Klenner, notes that she uses the petals in skin lotions, body butters and salves. She also makes marigold tea which soothes irritated mucous membranes and internal tissues. She uses the tea for digestive health, and adds that the petals are used in some cold and flu remedies. She also believes it supports the lymphatic system, crucial for our immune systems. Many of these terms might be unfamiliar to you if you’re not an herbalist or phytologist. Vulnerary means healing of wounds or inflammation. Cholagogue means to stimulate the gall bladder to produce bile. Emmenagogue means to promote menstrual flow. This means it can be useful for period pain or delayed periods, as it stimulates the uterus. Pregnant women should not ingest calendula for this reason. Always check with a medical professional before changing or starting any type of medication. Many believe that the term marigold comes from an association with the Virgin Mary. However, that supposition is a little backwards. The marigold (calendula) became associated with the Virgin Mary because the name sounded a little like Mary’s Gold, however the term ‘marigold’ was first coined by pre-Christian Anglo-Saxons, when referring to the marsh marigold, a plant related to neither calendula or tagetes (true marigolds). However, calendula has been used to honour Mary for so long that, if your path leans this way, it still makes a fantastic offering or altar decoration. It’s just good to know the origins and history so you can make your own mind up about what’s appropriate. Cunningham tells us it is a masculine herb, which I presume is because of the plant’s association with the sun, and fire. I find it has a very feminine energy, but plants are complex and it’s often hard to pigeon-hole them. He advises picking calendula at noon in bright sunlight to ‘strengthen and comfort the heart’. He also states that calendula is used for protecting the home from evil, and scattered under the bed can give you prophetic dreams and ensure a safe night’s sleep. Calendula petals in the pocket will keep justice on your side if you need to attend court. His final and my favourite point about calendula magic is that, if a girl touches calendula petals with her bare feet, she will be able to speak to birds in their own language. How wonderful that would be! Calendula has historically been used in divination, particularly relating to love and knowing who one’s true love may be. Rachel Patterson recommends the flower for spells or incense blends involved with psychic powers. She also writes that they promote happiness and uplifting energies, and can be used to make gossip about you cease. As we move from summer into fall, calendula should still be flowering for some time yet. If you are lucky enough to have calendula in your garden, pick a few of the flower heads and separate the petals out. Create a circle of petals on a clean cloth or on your altar, one petal at a time. Have the base of each petal pointing toward the centre of the circle, so the end of the petal points outwards. As you lay each petal, think of something in your life you are happy about, or grateful for. You don’t need to write this down or prepare for it. It should be spontaneous and from the heart. The bigger you make your circle, the longer it will take to complete, but you will think about more happy things! If you have been struggling with dark feelings or depression, it may be sensible to start with a small circle. This can prevent you feeling like you ‘should’ have more to be happy about, which can actually make you feel worse. Sometimes, we may only have a few bright sparks in our lives, and that’s okay. We can still celebrate that, and as we move into the darker months, focusing on the good things we have becomes even more vital and soul supportive. 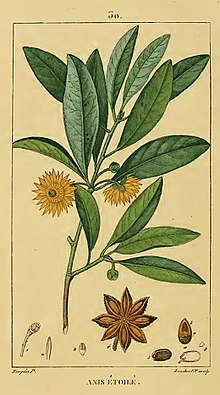 A snuff of marigold leaves was sniffed up the nose, to encourage sneezing to rid the sinuses of excess mucous. Lovely! Image credits: Flower of calendula by Wouter Hagens, public domain; Calendula officinalis, Seeds by H. Zell, copyright 2009 via Wikimedia Commons; Calendula officinalis – Botanischer Garten Mainz by Natalie Schmalz, copyright 2011, via Wikimedia Commons. Themis’ daughters are the seeds of extension for maintaining what has been decreed within the heavens. These are the controls that remand the individual to the laws of karmic order when encountered at death by their mother Themis. Their attributes are the affirmation of cosmic and earthly law being reflections of the same dynamics of order and balance that are upheld in both heavenly and earthly matters. Dike, in her role as keeper of justice and order made judgment of the moral order of humanity. Dike is often associated with the astrological sign of the Virgin, Virgo. The analytical and careful attention to detail being the primary energy called upon to maintain moral order and justice for all mankind. Hers was the responsibility to ensure that man acted in accord with right action and bestow swift punishment for any infringement, especially in the case of one who was acting as judge and counsel. Eunomia exerted her power as provider of governance of justice through good law. Legislation, judicial determination and their processes and the ultimate outcome of enforcing those determinations made were her specialty. Eunomia’s name is used to describe the “principle of good order”. Her image was often painted on vases and in the company of Aphrodite as a reminder of the need for lawful action in matters of the heart, marriage and loving relationship. Eunomia was the mother of the three Graces; Aglaea (Grace and Beauty), Euphrosyn (Good Cheer, Mirth and Merriment), and Thalia (Festivities and Banquets). Again, we see the disbursement of the mother’s gifts flowing through the Graces, each needing the space of governance to ensure neither excess nor poverty in their expression. Eirene was the personification of peace. Hers was the final blessing of the action of rightful justice exacted in a lawful way with resolution that would ultimately restore and disperse the Divine Justice of her mother, Themis. So great was her influence that the citizens of Athens set up an altar and erected a votive statue to her in the Agora of Athens. The statue shows her as a young beautiful woman holding the infant Ploutos (the God of wealth) in her arm. In artwork she is also depicted carrying a cornucopia, the symbol of the abundance that may be gathered when peace rules every action. There is much we can learn from the Horae and much we can apply to the way in which we live today. The principles of lawful order and justice for all of humanity remain the same. The desire for a peaceful coexistence and the balance and Karmic blessings that are the products is still a dream for many. Remembering the work of the Horae and the natural cycles that surround and are in support of a balanced and orderly life are the beginning steps towards establishing Themis, or Divine order. Taking time to honor and show devotion to the order that is established within your life already and then seeing it grow and extend exponentially into every facet of your life’s work, much like the energy imparted in the daughters of Themis and Zeus, will feed the archetypal energy of these Deities and draw the power of their pursuits back into balancing chaos and discord. And, the ultimate blessing will be that of knowing the peace of living a life that has come full cycle in embracing the cycles of the seasons, the will of the fates and scales at life’s end of Themis. 3. Hesiod, Works & Days – Greek Epic C8th-7th B.C. I think the very first spell I ever did involved a dandelion. I can see myself as a young child, picking dandelions with the dried puffy seed ball, making a wish, and blowing them onto the wind. I would watch as they danced on the wind like whimsical little fairies. Someone later told me if I got all the seeds off with one breath, my wish would come true. As I got older, I came to know how much adults with lawns hated the intense yellow flowers atop long stems, swaying in the breeze, and didn’t appreciate my spreading the seeds to make even more weeds. But I saw something special about them as they opened and closed with the light. I saw little suns looking up to the big sun in the sky, later equating it to male God energy. Then, when the plant went to seed, I saw it as the silvery full moon, or feminine energy which I later equated to feminine energy I came to call Goddess. The dandelion illustrated how both male and female vibrations coexist. As I got older, my wishes turned into dreams, and the abundance seeds floating off meant an abundance of chances that my desires would take root. I also, without really thinking about what I was doing, would blow on them to release what I no longer wanted, giving it back to nature to absorb and transform. It was like blowing a kiss goodbye to something. Now I see dandelions as containing the elements: the seeds are air, the flowers are the sun, the liquid in the stems as water, and both the green leaves and the moon I associate with north and the earth. Eat them (flowers, leaves, roots) and you will literally be taking the plant’s magic into yourself. This is the perfect time of year to be doing dandelion spells. Where I live, they have burst into full bloom this past week. They’re a powerful little plant; their name means “lion’s tooth,” thanks to their yellow “mane” and their jagged “tooth” shaped leaves. Look for that first seed head and let it carry your wishes, landing and planting, growing and prospering in the coming summer months. One spell I saw called for picking four seed heads, speaking your wish out loud to each of the four directions and then blowing a dandelion head in each direction, assuring they reach to the whole universe around you. Their proliferation helps in spreading possibilities and success. You could also blow on the seeds to send a message to someone or someplace. If you’d like, aim to blow all the seeds off an individual dandelion in one breath as an extra bit of good fortune. One of the things I like to do on Imbolc is bless the seeds I will plant in the spring. The seeds represent what I wish to sow in the coming months – both figuratively and literally. For me, they help mark the turning of the wheel. At Imbolc, they are blessed, at Ostara some are planted indoors in pots to be put outside at Beltane. Others are planted in the garden as the soil warms and the weather allows. They will grow and bear fruit to be harvested at Lughnasadh and continuing into Mabon; their seeds are then saved from Mabon to Samhain. 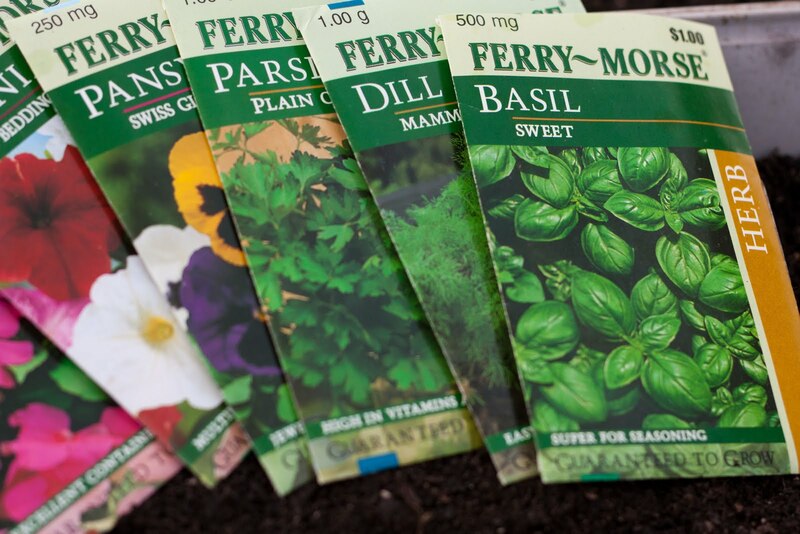 While most of the varieties of vegetables and flowers I put in my community plot are plants – because I generally want three or four of something, not 25 – I use seeds for some crops that are easily started on the windowsill or directly in the ground. Brigid is about planting seeds for the future. Just as a seed grows, flowers and produces a crop, so do thoughts need to be planted and nurtured so they will grow and produce results. That’s why I infuse one intention into the sunflower seeds and another into the miniature pumpkins. Seeds can be blessed by singing, chanting or directing energy in some way such as dancing, or passing over a flame. Hold them in your hands and charge them with energy and your intentions. Make these plants grow strong and tall. Blessed by the sun and the pale moonlight. In addition to seeds I collected from tiny pumpkins I grew from seed in my garden, I have collected seeds from two of the tomatoes that came from seeds my grandmother grew each year since leaving Sicily in the 1920s when she was still a teenage wife to a widow with four children. The seeds will sit on my altar until conditions are right for planting, at which time I’ll water them with rain or melted snow collected on full moons, dark moons and sabbats throughout the winter. Because spring signals new beginnings, this ritual is also fitting for Ostara. Please share how you adopted this for your celebration. I have been so busy gardening and learning about seeds, soil, and planning next year’s planting that Mabon, or second harvest, snuck up on me this time. I just can’t believe how fast this year is going by! Friends all shared their first harvests at Lughnasadh time. Some grew veggies, others flowers and herbs. Everybody gave thanks for the first things they harvested. My husband was so proud to bring the first tomato and the first berries of the season in to eat. Fast forward a month and a half, and we are cleaning up some garden debris and saving seeds from things we want to plant next year. Next comes pumpkins, of course, and the radishes and peas I put in the ground for fall harvesting. In today’s households, most produce is from the store, but some of us cannot resist planting gardens of our own. It’s not like I had anything better to do this year. It has been ten months since I have worked outside of the home. You guessed it, I am not well enough to go back to work yet. Truthfully, NOT working has taken a major toll on my self esteem. Of course, my husband LOVES coming home to a clean house and a hot meal every day. I, on the other hand, feel like my life is on hold and my perception of who I am has suffered. Who am I if I am not doing those things that I always considered to make me who I AM? I am still myself, despite what I do, and I discovered that while what I do changes from time to time, who I am really does not. At one time, I was a director where a lot of people relied on me to make things happen. Now, by professional definition, I am a nobody who has not earned one penny in months and is completely dependent on others. There was a time I gave rides to other people on a regular basis. Now, I can’t even drive myself anyplace at all most days. So you see, my focus went from being on worldly things, to being… well… sick. Anybody who has struggled with a chronic illness can tell you it is counterproductive to just focus on what you CANNOT do. It became crucial to focus on what I CAN do. And all year, I have done those things to the very best of my ability. I have continued my normal crafting, painting, beading, and cooking, of course, but gardening and touching the earth every day is genuinely what kept me sane. (Assuming that I am sane!) I have gardened for at least an hour a day, for seven days a week since the first week of May. Sometimes, that just entails watering plants. Some days it entails crushing eggshells into soil for organic fertilizing. Some days it entails research about certain plants. We planted something new almost every week, and started planning next year’s planting. Every day it entails going outside and being with Nature. As I age, my body is more and more affected by the seasons. I noted I could tell, based on joint stiffness, when rain was coming. After getting on hands and knees and standing up countless times to do garden work, and my blood pressure yo-yoing to the point I saw stars and psychedelic colors, my mood was always better. Not because of the blood pressure variance, but because touching the ground, tending the plants, and being outdoors in nature is naturally good for the human body. Besides making you more aware of coming weather, gardening also plugs you in to the seasons. A lot of people, for example, just cannot understand why they start to feel sleepier in late summer and early fall. A gardener knows it is because the days are shortening and the body is getting less vitamin D from the sun. The earth’s fruits have reached their limit and are ready to harvest. The nights are getting cooler and it gets light later in the morning. Our bodies respond to all of this. We have an illusion that we are separate from everything. We believe we are individuals who exist apart from all other individuals. We also have the illusion that other species are not as valuable as we are. Many of our creation stories even interpret gods or goddesses to be immortal human beings, and the earth and the animals were created simply for the purpose of satisfying human beings. We can kill another creature with no consequence, and we can step on other human beings to get ahead. But if you think about it, we really are not separate at all. Like I used to mistakenly consider myself an individual who could do everything all on my own, many modern people miss the fact that we are inter dependant on one another, and the earth, as well as members of the other species. Notice I said INTER dependant. Not CO dependant. Even if you work, live alone, and pay all of your own bills, somebody had to work to build that car you drive. Somebody further produced the parts it was made of. Then somebody had to ship the parts to the place where they built the car. A salesperson had to handle the sale so you could buy the car. The bank staff had to approve the loan. Even your boss has to sign your paycheck so you can have the money to pay for things. Having transportation and all the things that go into maintaining it is just one example of the fact that people rely on one another for everything, really. We further rely on animals. Even vegans do. Animals, aside from providing food sources, maintain populations. Predators, even domestic cats, keep critter populations in check so we are not overrun with them. Their bodies further decompose into the earth when they die, fertilizing it so our soil can support plant life. Plant life is both food, and a way to clean carbon dioxide out of the air so we can breathe. In this way, from death comes all life. Being part of nurturing plants entails prepping soil, planting seeds, caring for baby plants, harvest, and then saving their seeds for future planting. It creates understanding of how life cycles and our role in that. All this year, that has been my “job” instead of earning money. I always had plants, but never like this year. This year’s gardening has changed my perception of the cycle of life and my role in it drastically. It helped me realize that I am more than just somebody who earns money to pay bills. I realize we all are. This Mabon will be the first one I have fully participated in an entire cycle of life of plants. So this harvest will hold different meaning than if I just bought plants and tossed them after a few months. Mabon itself was first named by Aiden Kelly in 1970. He was referring to Mabon ap Modron from Welsh myths. He is associated with Irish god Oengus, ruler of Tir na Nog, land of eternal youth. Mabon is the Autumn Equinox. Day and night will be equal, and afterwards, the nights will lengthen. I always think of Mabon as the right time for Thanksgiving. In the US, we celebrate that in November instead. Mabon is really the time people are finishing up harvesting and storing the last of the crops and fruits before it gets cold. And of course, since foods are ripe and ready, it is the perfect time to feast and give thanks. Throughout history, many people have celebrated harvest. Pre- Christian days. The burial site was also used to keep track of seasons for agriculture. In a way, the dead were reminding their descendants of what to plant and harvest when! In England, Stonehenge is one place where the Autumn Equinox sunrise is still observed, the sun rising above the stones. Farmers would begin slaughtering animals and prepping meat for winter use as well as finishing up the harvesting of crops at Autumn equinox. In the British Isles, at sites like Loughcrew and Stonehenge, more than just burials were held. Some of those places had multiple structures for multiple purposes. Like the Hill of Tara, these ancient complexes seemed to be the sacred centers of all rites of passage, religious celebrations, and in some cases, lawmaking, matchmaking, and even places for royal or chieftain residence. In Japan, Autumn Equinox is a time for visits from the ancestors. Visits to families graves and tombs as well as making offerings of foods and incense are given. Greek myths say the goddess Persephone returns to the underworld at Autumn. When she leaves, wintertime starts to come in, when she returns in Spring, the warm days and growing season begins again. The god Kelly chose to name the Sabbat after is related to the god Maponos who comes from Gaul and Britain. He is compared with Apollo, of course, since Romans compared other gods with their own. In Britain, he is the son of the Dagda, father of the gods. In Wales, he is the son of Modron, a matron goddess. In modern Wicca, the god dies, a willing sacrifice into the earth. He will be reborn to the goddess come Springtime. Christianization brought Michaelmas, which is still celebrated. It is the feast of the Saints Michael, Gabriel, Uriel, and Raphael. Those who use the Lesser Banishing Ritual of the Pentagram will recognize those names right away as being those of archangels! Michaelmas at some churches specifically honors the archangel Michael, who is credited with defeating the devil. It was also a time when harvest was over, and workers would need new jobs. Hiring went on and accounts were settled during this time. Christianization bumped Lughnasadh sporting festivities to Mabon time instead. All was kept alive by the Christian church. Timeframe was rearranged and patrons were changed, but once again, the Christians kept the Pagan ways alive and well. The founder of modern Wicca, Gerald Gardner, gives a ritual in the Gardnerian Book of Shadows, which can be read for free on the Internet at sacred-texts.com. The altar is of course, decorated with seasonal offerings, and the Priest says, “ Farewell, O Sun, ever returning light. The hidden god, who ever yet remains. He departs to the land of youth, through the gates of death, to dwell enthroned, the judge of gods and men.“ More beautiful things are said, and a procession around the altar is lead. Dances and games are called for as well. Personally, I always have a feast when I am hosting with a very short ritual and blessing of the foods. By then, the exhaustion of festival season has set in, and people will soon begin Samhain planning, which for a lot of us, is a very big deal. This “in between” harvest, as some call it, is more enjoyable for some of us if it is kept simple and low fuss. Here is a simple, suggested working for you and your loved ones. Invite everybody over for the Sabbat and tell them you will potluck it. Have everybody bring with them a symbol of their own personal harvest. It can be things like garden plants, or evidence of accomplishments, or even a few extra dollars to donate to some cause. For many of us, the fruits of our labor are what we earn at jobs, and that is as good a harvest as any. Have everybody also bring something to give as tribute for thanks. This is an easy opportunity to raise donations for some cause. It can be as simple as asking people to bring non perishable goods for a local food pantry, or as fancy as doing a raffle, or even arranging to do some volunteer work together. My favorite harvest altars are not covered with ritual items, or decorations. They are loaded down with the fellowship gathering’s food. Have everybody put the fruits of their harvest on the table amongst the food, and the tribute on or around the table as well, if it is physical tribute gifts. To cast circle, join hands circled around the table, and take a moment of silence for everybody to focus. Then have everybody take turns, clockwise, starting at the East, saying a short prayer or blessing directed into the food, their harvest items, and the donations. The best part of this is that shy people who are not comfortable speaking in front of others can say their blessings silently while they direct the energy and well wishes into everything. This ritual form, as opposed to traditional Priestess and Priest and attendees puts everybody in the same role. Symbolic of community, it reminds, we all bring something to the group. Each person blesses every other attendees harvest, the food everybody will eat, and also the tribute. Together. When each person has done their blessing, let the fellowship begin. Eat, drink, and be merry! We are moving out of winter, a season of potential and stillness, a time for reflecting on the past and planning for the future. There may still be days with snow and frost, or where I live rain and chilly mornings, but the subtle signs of a month ago that the Earth was waking from slumber are now clearly visible. I saw a magnolia tree in bloom the other morning, and every day I pass dozens of patches of blooming daffodils and crocuses. I’ve noticed that I am becoming more fully awake as well right now. Ideas and thoughts which I had begun ruminating over back in December are starting to come together. Gentle synchronicities are guiding me to put thoughts into actions. In thinking of these things, I am reminded quite clearly of the Amulets I use in divination and oracle work. Winter’s time of stillness can be found in the ‘Hand with Seeds’ amulet. This is an amulet of responsibility, or as I like to say it “response – ability”, but it is also an amulet of potentiality. A potential for growth is present, but is not yet ready to emerge. The tools for change and growth are in your hand, but you have not yet planted them. This is where I was over the past few months. Slowly finding and gathering the seeds needed for my next stage of growth. One very clear message I kept getting is that I need to find a ‘warrior’s healing’ and continue practicing being in my body. Not sure where it would lead, I planted those ideas, those seeds, and left them to grow. The thing with seeds is that once planted, you can’t keep digging them up to check their progress. Have they grown enough? Are they ready to come up through the soil yet? Doing so will kill them. It’s the same with our own potential for growth when we plant our ideas. We have to allow them to grow in darkness. We have to trust that even though we can’t see results, things are happening as they should. Some seeds peep through the soil in a matter of hours, some take days, some may take months. Some ideas may be planted in a place that can’t sustain growth, others fall on fertile ground. I am reminded of one of the parables of the New Testament Christian Bible. This parable, according to biblical passages refers to people hearing the messages of God and heaven which Jesus was telling. I think it can also very easily bring meaning to the Hands with Seeds amulet. We each hold the seeds for change and growth which we need in our hand. Those seeds which we plant in good soil are the ones which will come to fruition. Those which we carelessly scatter on unsuitable ground may begin to grow but will quickly perish. I planted my own seeds over a month ago, and in recent days and weeks I have seen the beginnings of growth starting to emerge. My seeds in hand have become seedlings. These ideas which were planted are beginning to emerge. One friend’s off hand comments about Forrest Yoga which led to me reading “Fierce Medicine.” A Tai chi/qigong class I started taking in February. An opportunity to be a case study for someone seeking certification in Emotion Code Healing, and work I have been doing on myself in this area. A link a friend sent me on a global EFT webinar which led to reading a book on using EFT for body acceptance. Another friend’s random recommendation to her Facebook followers for a book on learning to love one’s self. “I (heart) Me: The Science of Self Love”. A computer generated book recommendation based upon other things I have read which led to my finding “Warrior Goddess Training Becoming the Woman You are Meant to Be”. Some seeds which relate to ideas I have on my own body image have emerged that I don’t particularly like and believe me I would love to be able to stamp them back down into the ground, but I can recognise that these seedlings are opportunities to remove obstacles from my past which have held me back and kept me from being fully present inside my skin. It may be that over time some ideas will be thinned away so that the strongest can thrive as I re-evaluate just what it is that I want and need. For now though, I am letting each grow to see what it can become. What seeds are you growing right now in your life? Hand with Seeds and Sprouting Seed Amulet images are both taken by NanLT. Because a common Imbolc ritual is to bless seeds, the timing is right to plan a magical herb garden. Do you find yourself buying chamomile and rosemary for magical purposes? Do you use vervain or St. John’s Wort? Would you use lavender and rue more freely if you didn’t have to buy it? Do you think you’d like to make an offering of tobacco now and then, but you don’t smoke? Make this the year you grow your own. If you have a garden center close by, you might be able to find everything you’re looking for there. If not, there are many places online. If you can’t get the packets in time for Imbolc, you can still set your plans in motion. Packets of organic seeds cost from about $2.50 to $3.75 or so. Chances are, you won’t be able to use all 200 seeds, or 100 seeds, or even 20 seeds. Save money by finding more people who want to do the same thing and divide up the seeds. You might also save on potting material this way. Plant in egg cartons, tin cans and other throwaway containers, reclaimed pots or even simple ones made from newspaper. Start simply and do a bit of research. Some seeds like to be presprouted, others do better if the hull is scraped up a bit. Once sprouted, thin out the weaker plants. Keep them watered and give them lots of light. If there are several in one container, you might want to transplant them into their own containers if the weather does not yet permit them to be put outdoors. If you only want two or three different plants, consider buying them as seedlings. It’s more expensive than starting them yourself, but less expensive than buying the herbs fresh at farmers markets – if you can find them. Look for plant sales and seasonal events put on by your local herb association for the very best quality and selection. Ours has an Earth Day celebration in April and often a vendor or two will sell plants at our Pagan Pride Beltane Festival. Consider reaching out to coven members, co-workers, neighbors or Facebook friends to swap seeds, seedlings or harvested herbs. Be sure to save seeds for your plants next year. Even cheaper is wildcrafting. Learn to identify magical plants in the wild. Do your research to be sure the plant is what you think it is, and harvest it responsibly. Mugwort grows in the parking lot of my former office building, there’s mint growing wild by one of the water faucets in the community garden, and there’s a patch of violets that increases every year along the perimeter of the condominium complex. Pay attention when you’re outside. Ask for guidance. And when you are rewarded, offer gratitude.